The results of hundreds of marijuana lab tests in California are alleged to have been falsified, Utah’s governor signs a compromise medical cannabis bill, and two former executives from MJ retailer Sweet Leaf land in jail. 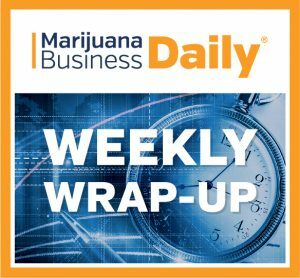 Here’s a closer look at some notable developments in the marijuana industry this week. The hundreds of allegedly falsified lab test approvals that came to light in California will have far-reaching ripple effects across the market, both for good and ill.
Sacramento-based Sequoia Analytical Labs surrendered its business license to the state after a lab director was accused of falsifying the results for 700-800 pesticide tests. Longtime industry insider Zeta Ceti, owner of Green Rush Consulting in the Bay Area, predicts there will be a lot of “suffering” but also several upsides. Lengthier wait times for products to be tested in January, when new testing regulations kick in, unless Sequoia regains its license by Jan. 1. Potential lawsuits – or one big class action suit – against Sequoia by companies that have products recalled because of the alleged fraud. Possible changes to testing procedures and state oversight of MJ labs. In the near term, Ceti predicted, there will be a lot of turbulence for the dozens – if not scores or hundreds – of companies caught in the fallout. It’s not clear, he said, how easy it will be for the state to implement a product recall given the large number of companies that were affected. “It’s a big mess, in terms of how are they going to comb through all these records, and how you’re going to recall products, how much it’s going to cost and how long it’s going to take,” Ceti noted. He also predicted the situation will result in greater scrutiny of labs. Moreover, it’s unclear whether the debacle will prevent Sequoia from getting its business license back, perhaps leaving California operators with one fewer lab to rely on in a market that’s already underserved. After Utah’s Legislature and governor approved a bill legalizing medical marijuana, the state’s upcoming MMJ market will offer fewer business opportunities than those spelled out in a voter-approved initiative. Chase Thomas, executive director of the Alliance for a Better Utah, said lawmakers “should have honored the substance of the (initiative) more than this” and his group is lending legal support to a challenge of the compromise law. Under the compromise, a state-owned central pharmacy might end up distributing much of the MMJ product, especially in rural areas. Only seven dispensary licenses will be issued. The state is required to start accepting business license applications in early 2020 but has indicated it will try to move faster than that. The updated Marijuana Business Factbook 2018 projects sales of $15 million-$25 million annually several years after the market’s launch, unless the rules are made more business-friendly. The number of private dispensaries, called pharmacies, will gradually increase from seven to 10 if the state-owned central pharmacy doesn’t become operational. The dispensaries require a licensed pharmacist. The voter initiative had called for 20 dispensaries. Ten cultivation licenses will be issued. That number can be increased to 15 if the state deems it necessary. Unprocessed marijuana flower can be sold but must come in blister packs of no more than 1 gram each. Edibles are prohibited, except for gelatin cubes. The first felony charges were filed against former Sweet Leaf executives, with an indication that more may surface in response to an alleged illegal sales “looping” scheme by the once high-flying Colorado marijuana retail chain. Nichole West, former vice president of the company, and Ashley Goldstein, former retail operations manager, started serving 30-day jail sentences last week as part of lower felony pleas in exchange for their continued cooperation in state and federal investigations, according to the Denver District Attorney’s Office. Co-owners Anthony Suaro, Christian Johnson and Matthew Aiken reached a settlement in October with state regulators that required them to pay roughly $2 million in fines and back taxes and to stay out of Colorado’s MJ sector for 15 years. But that settlement doesn’t preclude the potential for criminal charges, Robert Mikos, a Vanderbilt Law School professor who specializes in marijuana law, said in an interview after that settlement. The Denver DA’s statement this week about ongoing state and federal investigations seems to keep that possibility in play. Earlier, Sweet Leaf lost all its Colorado licenses, including 26 in Denver. A Sweet Leaf store in Portland, Oregon, is listed as being open. Hahaha. May they all go under. Grow your own, as they used to say, eh?